SuppliesToner / Drum Cartridge 24K average yield. Customer Replaceable Units to maximize uptime and avoid service calls. Our price guarantee includes Xerox Workcentre 423si Copier Toner! 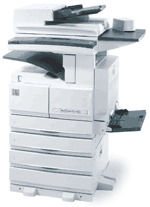 Our price guarantee includes Xerox Workcentre 423si Copier Drums! Please contact us for quotation of this product, thanks! (c) 2006-2009 Autoprint Copier Sales & Services. All rights reserved.